Crossing Togo comprises Scott Spencer, guitarist and songwriter, and Ko, vocalist and lyricist. Their debut album, “Of Love, Scorn & Insecurity” is a culmination of their two year songwriting partnership. The eclectic duo was formed in the Heights area of Houston in 2007 when Ko posted an ad in Craigslist following his firing from a Southern metal band. Ko spent his early childhood in Japan and moved to Kentucky at age 8. His multi-lingual background drives his fascination with semantics. He claims to often spend hours pondering the meanings, implications, and emotive impact of individual words. Scott is a fourth generation musician and fifth generation Texan and grew up surrounded by musicians; his first memory of music is of his mother playing the piano and singing old church hymns along with his sisters. 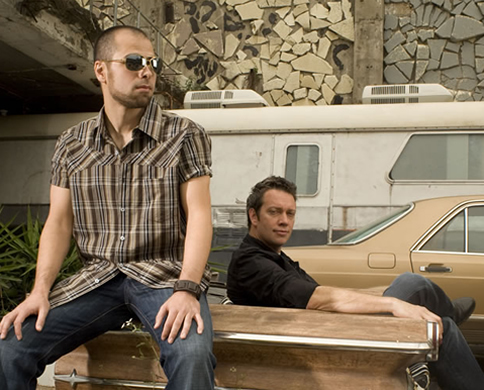 Their multi-instrumentalist producer Eric Jarvis plays an essential part in the project. “The project was a give and take process with Eric providing ‘Sherpa-like’ guidance,” Scott explains. "I met Eric on a tour bus when he was opening up for ZZ Top and we immediately hit it off so working with him was effortless; we seem to speak and think in a similar musical vernacular.” The songs were recorded at Eric’s Houston studio, crushpad productions. Drawing from a wide pool of talent, Eric enlisted an extraordinary group of supporting musicians for the album, including drummer Matt Johnson (Jeff Buckley, Rufus Wainwright, Martha Wainwright), percussionist Brendan Buckley (Shakira), Ben Peeler (Shakira, The Wallflowers) on lap steel, oud and saz, Kevin Lovejoy (Spoon, Kat Edmonson, John Mayer, Fastball) on piano, organ and keyboards, Max Dyer (Houston Ballet Orchestra, Moons of Jupiter) on cello, and Houston producer Dan Workman (owner of SugarHill Studios) on SK-1 keyboard. What results is “Of Love, Scorn & Insecurity,” a debut album that you will take you on a musical journey. ©2009 Mandorla Music. All Rights Reserved.